Itll soon be five years since celebrity comedian/political satirist JIMMY TINGLE (60 Minutes, Comedy Central, The Tonight Show) came and conquered Ayer-Shirley Regional High School with his American Dream tour. Well, hes back and with a vengeance. 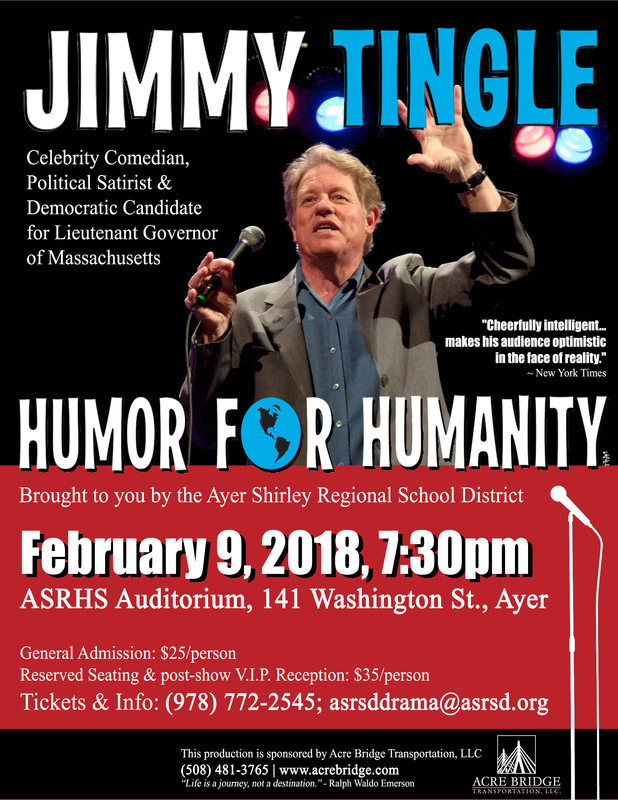 The now Democratic Candidate for Lieutenant Governor, Jimmy Tingle is bringing his Humor for Humanity to ASRHS Auditorium on February 9 at 7:30pm. Tickets are $25 per person; $35 per person for V.I.P. Seating with a post-show meet & greet with Mr. Tingle.